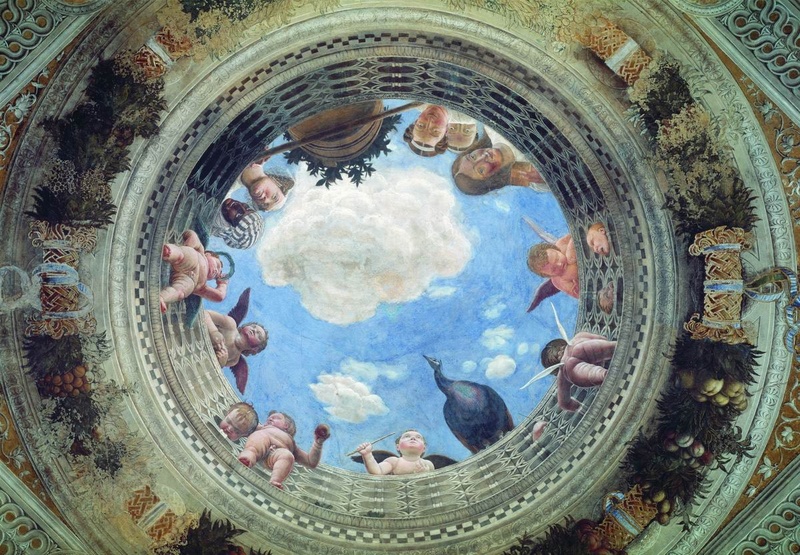 Ceiling, Camera degli Sposi, Ducale Palace, Mantua. Andrea Mantegna. This was so much fun to make with Sam. It brought back wonderful memories of similar dishes in Mantua, where we took Sam when he was a kid. This recipe comes from a mash up of Biba Caggiano’s Biba’s Taste of Italy and Marcella Hazan’s Marcella’s Italian Kitchen. The pasta from Hazan and the filling from Caggiano, with some variations. This made enough for three people. Previously, I had taken the whole Seminole Pumpkin, quartered it, removed the seeds and stringy stuff from the center (by the way, clean, salt, and roast the seeds for 15 minutes. They are a delicious snack.) Wrap each quarter in tin foil and place on a baking tray in an oven at 350 degrees F. for one hour. Check with a fork or skewer to make sure the pumpkin is soft all the way through. Remove from the oven and let cool. Scrape the flesh from the skin and mash (no need to purée at this point. Freeze what you don’t need immediately. 2 cups of baked pumpkin flesh, mashed. 1/2 cup of good reggiano cheese, grated. Pinch of fresh grated nutmeg. Place the pumpkin flesh in a jelly bag or cheese cloth and let one quarter cup of liquid drain from it. Take this liquid and reduce it until it is a lovely golden syrup and reincorporate into the pumpkin. Mix in the cheese, nutmeg and salt to taste. Let it rest while you make the pasta. 1 cup of semolina flour. Dump the flour on a clean counter. Make a well in the middle large enough to hold the eggs. Crack both eggs in the well. Using a fork, gradually stir the eggs into the flour, slowly beating them, until the eggs are incorporated. This methods let’s you push aside any extra flour, or add a little more if necessary. Then use your hands to work the mixture until you have rough dough. Wash your hands. Scrape up any dough attached to the counter. Then knead the dough for eight minutes, until it is a silky but stiff ball. It can be stored for a couple of hours wrapped in plastic wrap, but do not refrigerate it. I am assuming you have a pasta machine, if not go and but one. 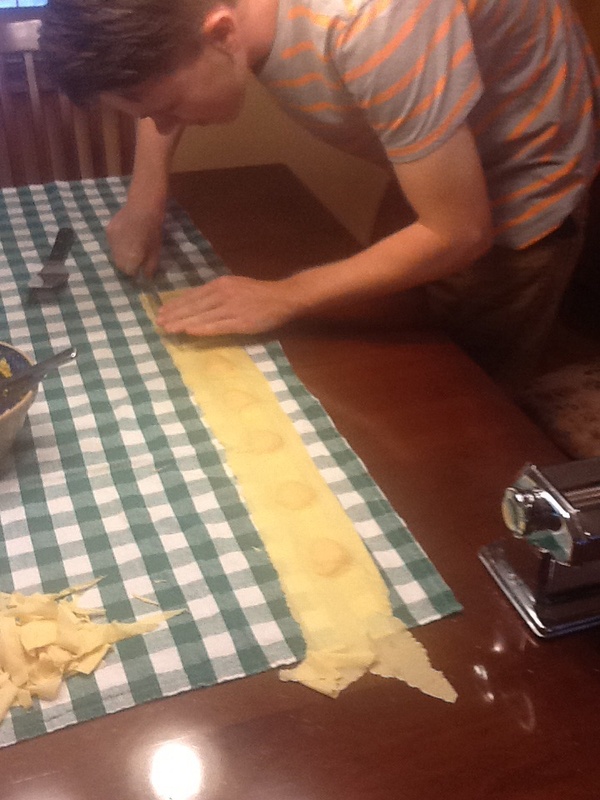 Rolling pasta by hand with a pin is a pain. At this point you are going to want to have your filling ready, so see above. Divide the dough into four quarters and roll into balls. To make the tortelli sheets, pass each ball through the machine from the widest setting to the thinnest, processing one ball at a time from beginning to end. Your sheet should be about five inches wide. It will be a few feet long. Once you have a sheet ready, lay it out flat. I find a large kitchen table with a table cloth works well. Starting at one end place a small tablespoon full of filling exactly in the center of the sheet about an inch from the end (you may need to trim off the irregular end of the sheet.) place the next spoonful of filling 2 1/2 inches from the first. Carry on until you have reached about one third or 2/5ths of the way down the sheet. Take up the other end of the sheet and bring it up to an inch before the last spoonful of filling. Carefully drape the sheet over the filling, letting the sheet fall naturally over one filling and into the valley between it and the next, carry on until you reach the end of the sheet and fillings. Then careful seal the two sheets together around each spoonful of filling, ensuring that there are no air pockets, but also being very careful not to tear the sheets. Press the rest of the sheets together, again, avoiding air pockets. Finally cut away the pasta so that each tortelli has about an inch of pasta around the filling, they will be about three inches square. Store the spare pasta in the fridge, it is great in soups, or with a ragu. Place the finished tortelli on a baking tray covered in parchment paper with a sprinkling of flour. Cover with more parchment paper. You can prepare these tortelli with a ragu, but I think that is gilding the lily. A simple butter sauce makes them shine. 5 tbsp of unsalted butter. 1 dozen fresh sage leaves, whole. Bring a large pot of water to the boil and salt it generously. Gently place the tortelli in the water and boil for two minutes. You may need to cook the tortelli in stages. Remove with a slotted spoon, making sure you bring as little water with you as possible. 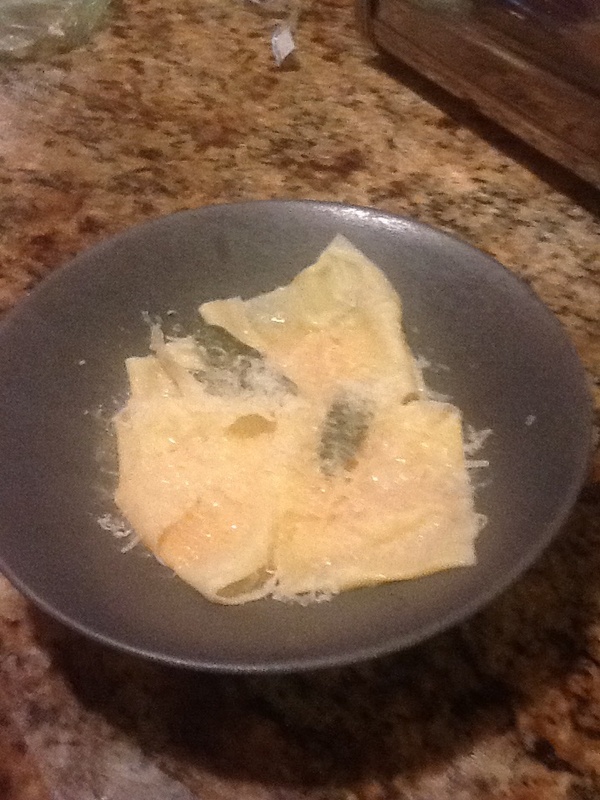 Place the tortelli in warmed individual pasta bowls. Add the butter and sage sauce, and top with the cheese. Serve immediately with a rich white wine, or a light red.